The LA Unified board is preparing for a big spend on health care tomorrow when the members vote to approve a tentative agreement with eight labor partners on a package of benefits through 2018. But Monica Ratliff, the District 6 member, said in a statement this morning from the district that she wants to delay passage, pending a deeper analysis of the district’s financial situation, including how Gov. Jerry Brown‘s revised state budget, due next month, would impact LA Unified. Ratliff is asking that action on the health care package be held off until several conditions are met. Besides the governor’s revised budget, they include: how bankruptcy could impact district retirees and employees, how declining enrollment interacts with the budget and nearly $11 billion in other post-employment benefit liabilities and what impact these commitments would have on the district have over the next 10 years. She said she wants “a thorough written analysis” provided to the board and the district’s labor partners. As crafted, the package of health care benefits builds on the $1.03 billion allocated for this year, with increases over the next three years that bring the spending to $1.09 billion for 2016, $1.16 billion for 2017 and $1.23 billion for 2018. Those figures represent increases of 6.5 percent, 6.1 percent and 6.1 percent over the three years. The money would cover about 225,000 current district employees, retirees and their eligible dependents and is subject to approval by each of the unions before final adoption by the school board. The benefits package has been put together by a committee that works outside of the district’s collective bargaining efforts with any of the unions. For the teachers, whose union, UTLA, is still negotiating for a new contract with the aid of a mediator, it means the possibility of an agreement on a major financial issue. 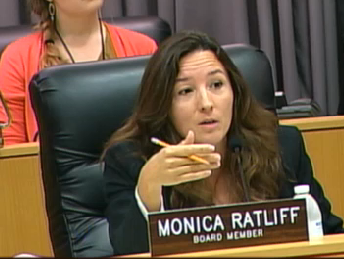 If the board approves the health care package tomorrow, UTLA would hold a ratification vote by its members. The unions that would be covered are: Associated Administrators of Los Angeles, California School Employees Association, Los Angeles/Orange Counties Building and Construction Trades Council, Los Angeles School Police Association, Los Angeles School Police Sergeants and Lieutenants Association, SEIU Local 99, Teamsters Local 572 and UTLA. They include Take our Daughters and Sons to Work Day, National Autism Awareness Month, National Library Week, Denim Day (which deals with sexual abuse), Month of the Young Child, Teacher and Substitute Teacher Appreciation Week, Administrative Professionals Week, Be Kind to Animals Week and the 100th Anniversary of the Armenian Genocide.